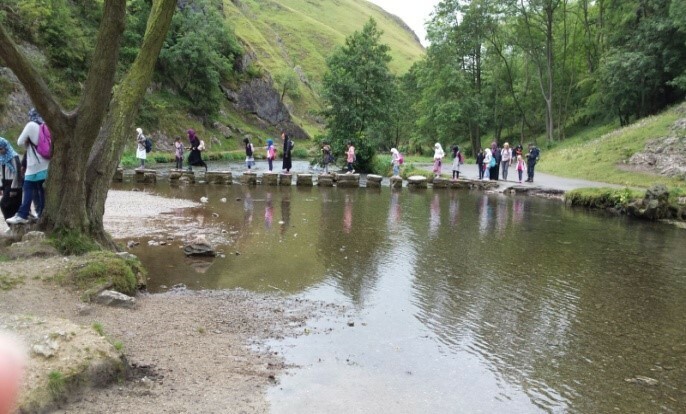 The At-Taqwa Children and Youth went on a day trip to Dovedale in the Peak District. 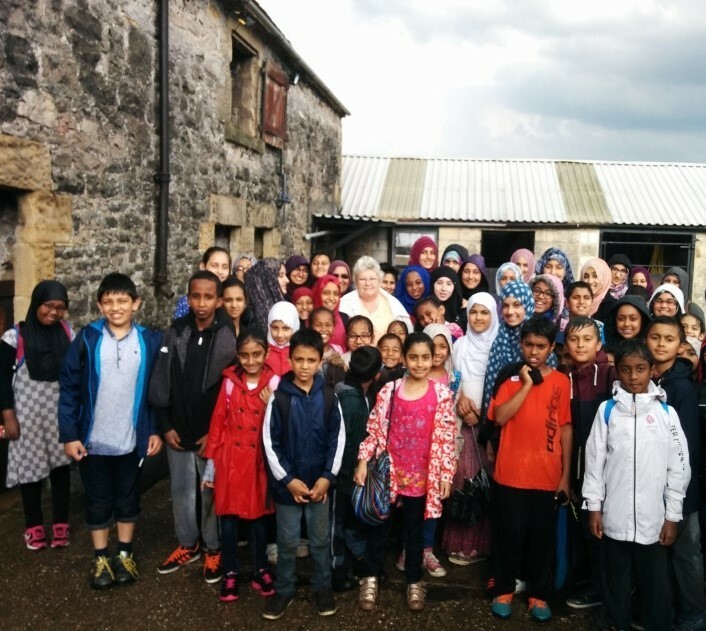 Every year, the organisers of At-Taqwa Children and Youth arrange for an annual day trip for the Masjid’s youth and helpers, to allow them to learn and experience something different, new and exciting for them. 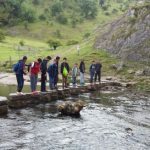 We started our walk just outside the Dovedale car park. 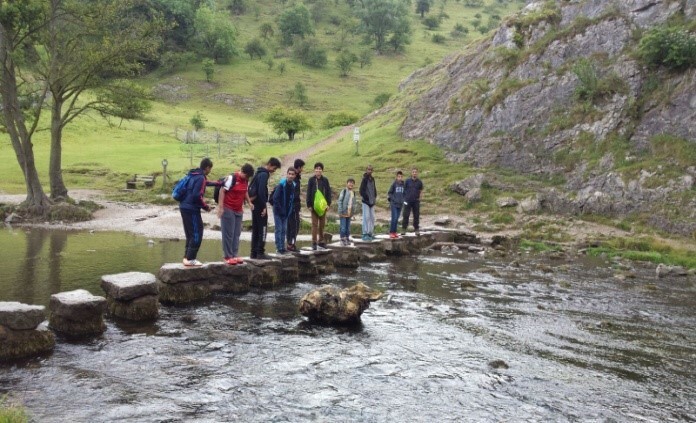 Walking for half a kilometre we reached a turn in the river where we crossed the famous Dovedale stepping stones. 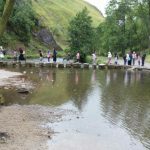 In front of the stepping stones lies Thorpe Cloud which towers above the stepping stones. 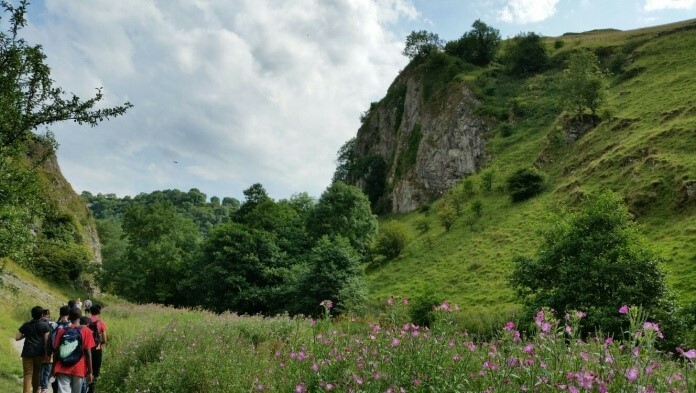 Thorpe Cloud rises straight up from the River Dove and reaches a height of 942ft. Its distinctive conical shape gives the hill a mountainous feel. This was a short but strenuous walk for our group who were not content to just picnic by the Dove. 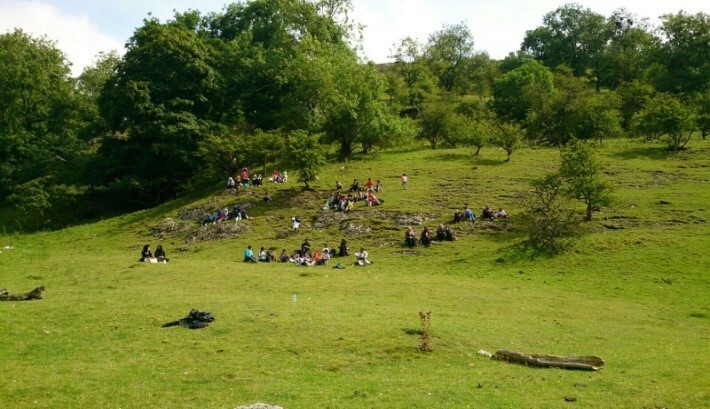 After conquering our ‘mountain peak’ and enjoying the breathtaking views, we sat back and enjoyed our picnic delights. 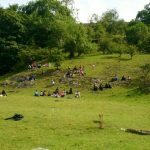 The well deserved picnic, tree climbing and play on the hillside at the stepping stones meant we were ready for our 3.4 mile trek to Milldale. We followed the route down the dale. 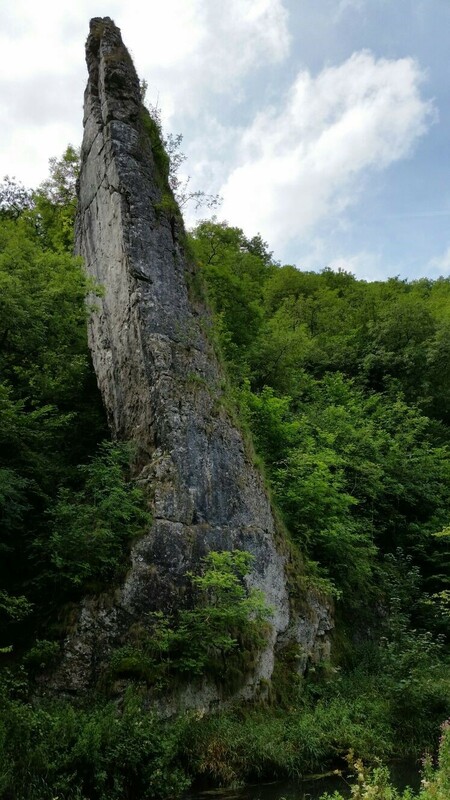 After a slight ascent over steps we reached an outcrop called Lover’s Leap. Here we clambered up the rocks for a beautiful view down the dale. Soon after we passed the gigantic Tissington Spires. 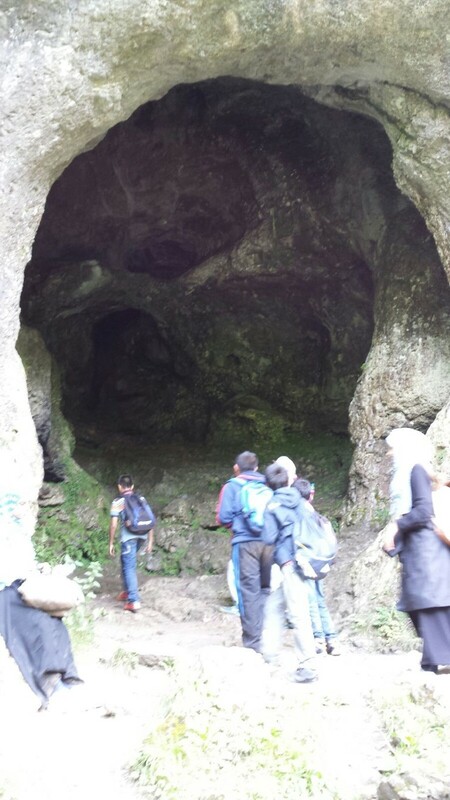 We continued along the path until we reached a point where another path leads up to up Reynard’s Cave. 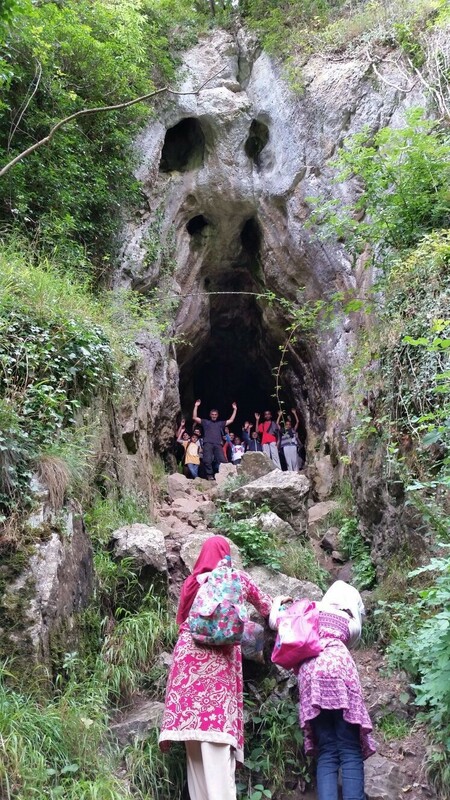 Some of us ventured up the steep ascent through the woodland and a short climb to reach the amazing entrance to Reynard’s Cave, a huge natural arch made of smooth limestone. 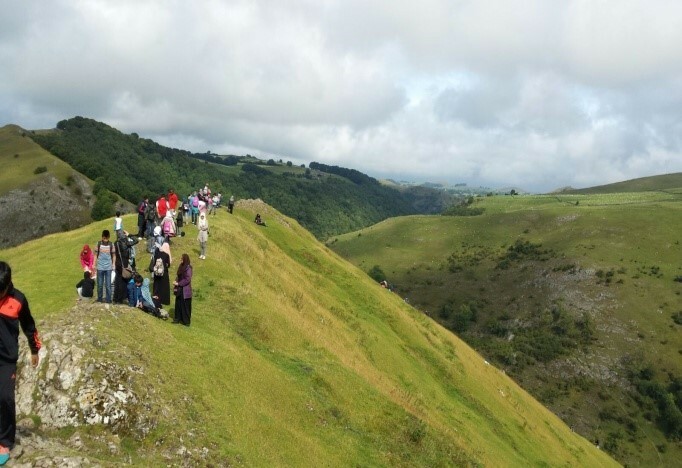 Looking out over the dale are beautiful views. After descending carefully back down to the main path again we came to wooden footbridge across the river. 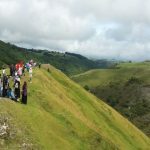 Here we saw the huge pinnacle of Ilam Rock. 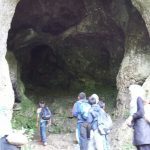 Continuing along the path we headed around a series of bends amidst the woodland until we came across two huge open caves on the path in the cliff. These are the Dove Holes. 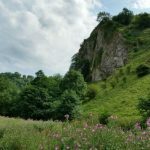 After admiring the magnificence of the Dove Holes we continued along the path where it passes through a narrow section with steep sides closing in. The path here turns into a boardwalk. 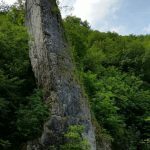 We crossed few small meadows until a small stone bridge to reach Milldale. Milldale is a picturesque little village with a few stone cottages and a tiny road. 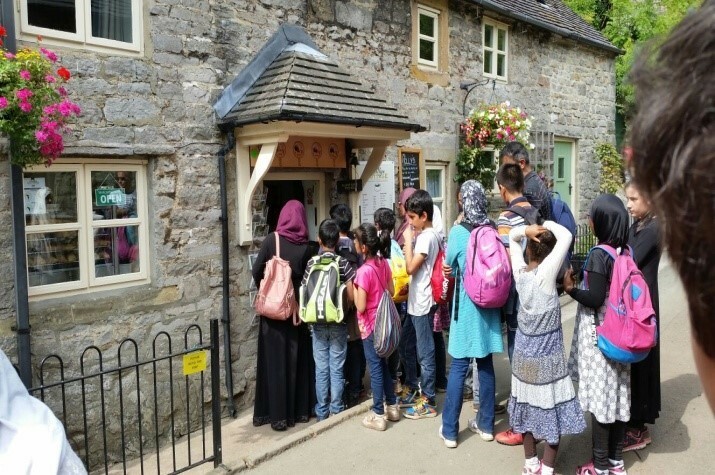 A lovely little tea shop provided much needed relief selling Ice creams and drinks. 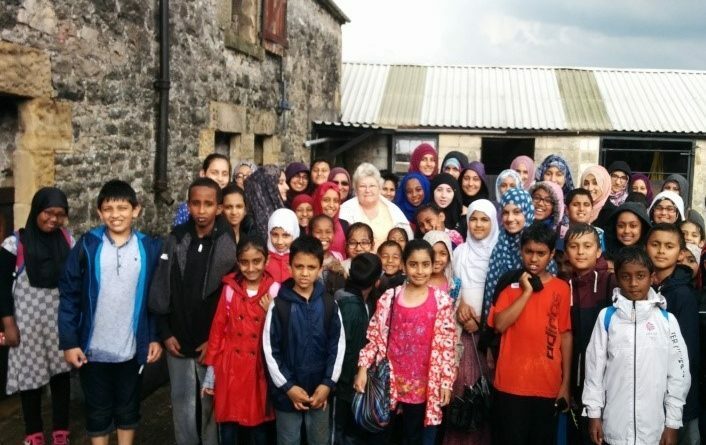 An outdoor tap provided the opportunity to make wudhu. A revitalising treat for reaching our destination. Our children decided to take full benefit of the shallow river here and paddle in the water. 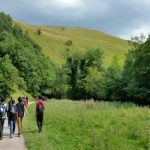 Walking back to Dovedale was looking like an arduous task for some of us. 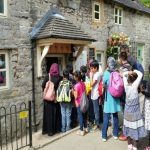 The National Trust information centre was extremely helpful in helping us navigate our return journey. 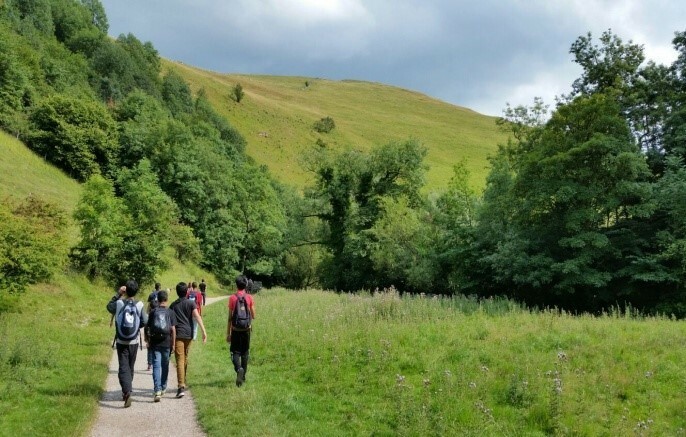 They advised we walk a mile to Alstonefield and arrange for our coach to meet us there. Our teenage boys group set off together with their team leaders to trek back to Dovadale to fetch our ride home. Getting soaked in a torrential downpour in the middle of a thunderstorm was not on our agenda, but a thoroughly enjoyable experience. 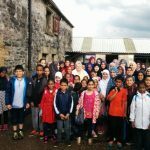 At Alstonefield we were rescued by Christine the owner of ‘Church Farm’ who provided us shelter from the rain in her cow shed. She showed us great hospitality and care. We walked to the nearby car park and cheered as our coach drove into the village. Alhumdilllah. 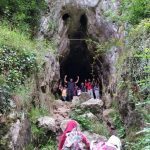 We walked approximately 6.5miles, combated some of our fears, scrambled up rocks, made new friends, saw some magnificent views subhanAllah, climbed trees, explored caves, paddled in the river, skimmed stones, got soaking wet, encouraged each other, strengthened our character and inshaAllah made long lasting memories.